Accounting Templates for Excel are designed specifically for small and home based businesses to simplify the process of creating standard and accurate financial accounts. The Excel accounting templates provide a simple and effective cash basis business accounting with ease of use and interpretation by minimizing input requirements. Only an account selection and the total received or paid for a transaction is required as input. Each transaction is associated with a month range and the transaction date can be included along with any other notes in the transaction comments area. 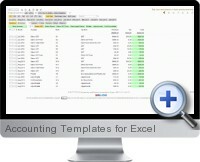 Accounting Templates for Excel allow for quick setup of accounts and any associated sales tax components (e.g. VAT) for both income and expense accounts and calculates totals by month, quarter and year. Income, expense and profit totals by month are calculated and displayed graphically for analysis. Once accounts are setup, income and expense item transactions are added directly from drop down lists reflecting the set up accounts. A comment column allows additional details to be optionally added for each transaction. From the selected account details any tax item to be applied is identified and income or expense and tax components of the total received or paid are automatically calculated. Income and expense lines can be continued across following months and quarters to provide easily identified consistent accounts across months to ensure all transactions have been recorded. Standard spreadsheet functions can be included as input values for repeating inputs including account, comments, received and paid values. This allows a single input to be reused and reflected in following months. Income, expense and profit values for each month are calculated and plotted on the income and expense by month chart. This excludes any tax components and provides a clear indicator of business performance and trends over time. Accounting Templates for Excel are compatible with all versions of Excel including Excel for Mac and OpenOffice for all operating platforms. An alternative version of Accounting Templates for Excel is designed specifically for Goods and Services Tax (GST) and Business Activity Statements and can be found at BAS Business Accounts Software for Excel.